It was only but a few weeks ago when I met Joyce. That morning we arrived in Acholi Quarters. An area where Joyce and her family along with 10,000+ others fled to escape the brutal massacres being carried out by the Lord's Resistance Army (LRA). Local vendors on every corner, kids running up and down the streets playing tag, and mommas sitting on the steps greeted us as we drove by. We pulled into the driveway of a small building, which was called their "church". We stepped inside and it was so much more than a building. You could feel peace, this was a place of refuge. Shoes blocked the entrance and kids filled the space to the brim, laughing, singing and for what seemed like the entire time- there was nothing more on their minds but to enjoy each others company and to try to forget what life is really like outside of those walls. This is the daily reality for many. I remember looking up and seeing Joyce. God's hand is on her and she is different, this place was different. And God is doing a new thing. We took some time with her as she welcomed us into her home. She began to open up about being a pastor's wife, mom, and ‘momma’ to many of the kids she watches from her extended family and how she loves on them on a daily basis. I couldn’t help but admire her transparency, her faith, and her courage. The kind of courage that is reckless. The one that moves you! She is doing everything she can to help support and care for her family, and we (you reading this) and I get to be a small part of that. You see, I truly believe God brings people in our lives that carry us through seasons. Some seasons where we may feel like we can’t take another step. He brings in people who can support us, encourage us and push us closer to the finish line. There’s a fresh momentum when we begin to link arms with those paving a way for others, and when we allow God to work in us. Sometimes its uncomfortable, but God orchestrates things perfectly in His timing. Joyce expressed the many hats she wears, and how many days she is running solely on the hope she has for her family. It's tiring. It's rewarding. It's brave, and now, It's our time to help. She showed us the necklaces her and her daughter make and the desire to see them sell so they can have extra income to provide what her heart yearns to do for her family, and when possible for her community. They are hand woven, and take two days to finish one. They're beautiful. She has BIG dreams, and through her faithfulness and trust In God- I know they are already beginning to take shape. Joyce may not see the big picture now, but she is making a difference! And we are so excited to join her in this journey, and support her. My life changed when I asked myself If I would be willing enough to give what Joyce gives on a daily basis. Could I strive to be more like her? She walks and loves just like Jesus does. Brave, compassionate, selfless and looking for no reward other than seeing others reach their full potential and live a life fully devoted to Christ. God desires to use you just like He does Joyce and her family. I wanted to share Joyce's story with you, I would like to ask you to be a part of helping Joyce provide for her family and community by purchasing this beautiful handmade jewelry. If you'd like to do more and help spread the love she is pouring into the people of Acholi please visit our shop and purchase one of the necklaces made by Joyce! Purchase a Paper Bead Necklace of HOpe - Today! It has been a little over a week since we have been back from Uganda and I am still processing what happened on our most recent trip. I know, it’s crazy; but it wasn’t just a short visit to see the kids living in the children’s home. This time we had purpose and we knew it would be different. It was a trip that sparked vision, broke our hearts and made our role in these kid’s lives so much more real. There have been many people on our trip who have had a hard time adjusting to the normalcy of our life at home. I remember flying home last Wednesday and that evening rocking my youngest daughter, Kynlee, to sleep and I literally just started to weep. During our trip, I was humbled to take the clothes that my girls had grown out of and dress these little babies we came across. There mom’s looked at me - not with eyes of appreciation; but eyes of a desperate mother who was so thankful that someone had thought of their baby. This most recent trip showed me that the families and children in Central Uganda have deep wounds. Project Orphans must step up our game! We can’t just provide necessary means to survive, education, shelter and other resources. We must dig deep and begin healing wounds in these people’s hearts. This isn’t an easy task and it will take lots of time, work and effort; but we are up for the challenge! 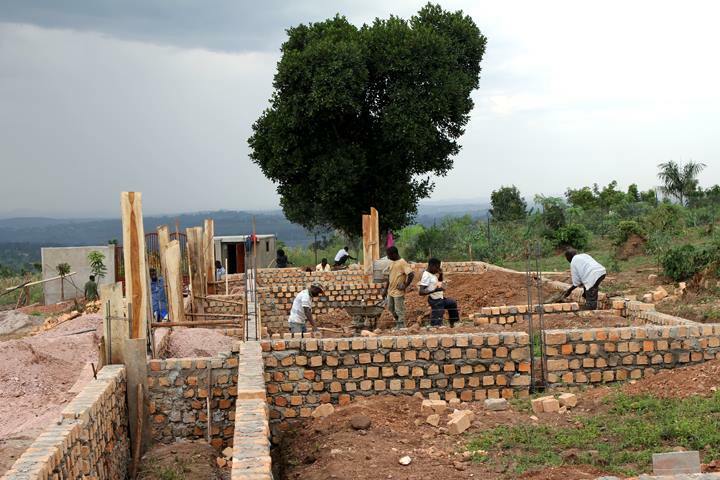 When we were in Uganda we broke ground on the opportunity for children to attend school. It’s a huge step of faith for us. We will have monthly salaries to pay plus children’s tuition. While in Uganda, we captured the story of Sophia. I can’t wait to share with you her story and this video. She is a precious girl that motivates me every day to get out of bed and find a way for her and her friends to go to school. Sophia doesn’t know how to read or write. She barely speaks English. She didn’t understand why we wanted to video her life. But she knew we truly loved her! I remember on the way to go visit her home she grabbed my hand. It’s a moment I’ll never forget. She didn’t grab me because she wanted attention; but because she wanted to hold someone’s hand who loved her and who had love to give her. Sophia’s home was worse than our team had expected. Her mother rents a room for Sophia, herselfand her other daughters from two men who to me were completely bad news, if you ask me. Sophia’s mom is pregnant with her fourth child and she is not married. Sophia has no father figure and is stepping in at seven-years-old as the provider and caretaker. The four of them share a twin size piece of foam for a bed - which is next to their most precious possession. Their chicken and its baby chicks. They don’t have a kitchen. In fact, they use a pair of pants as their table and table cloth. I’m not sharing these facts with you to make you have pity. I’m sharing them with you because this is the reality for hundreds of children living in Kiwenda and you need to know. You need to know because some how there is a reason you have taken time out of your day to read this blog. You care and that is okay. I care too and sometimes I feel completely lost and helpless. But I need to tell you - we aren’t helpless. We can change their world. Already, we are changing Sophia’s world! Two days after filming Sophia — our team went back to her home caring two mattresses for her and her family! Sophia ran to us with the largest smile that I have ever seen. Then I realized… did she understand why we were filming her? We shared with Sophia that she is going to be able to attend school; and not have to worry about the money to pay for school tuition or her new uniform! Sophia stopped right there and dropped to her knees and started to kiss our feet. I used everything inside of me to hold back the tears that were about to pour out of me. At that moment, I wanted to get on the ground and kiss her feet. Who am I to deserve this child’s gratitude? I am no one - I’m just one part of this organization bringing the support of everyone back home who made this possible for Sophia. Thank God we only documented Sophia’s story. I don’t think I could handle much more! All I know, is there will be testimony after testimony of kids just like Sophia - who never had the opportunity to even dream about going to school, finally having a chance to be more than what they ever even thought was possible. This idea to give education is just one of many projects stirring in our hearts! We are excited to complete this and start hustling on the next opportunities that God is opening in Uganda! There are many more stories to share with you. I’m still putting words together for other moments we experience. Sophia’s story will be released tomorrow. I ask you to watch it with an open heart! Also, please share her story - the more people who know the more people can have the opportunity to be part of Sophia and so many others future. Our goal is to have her story shared in several homes - sparking passion and conversation to help Project Orphans in our endeavors to find sponsors for the children attending. We are also working to find churches around the United States who will share Sophia's story on Orphan Sunday (November 13, 2016) and take an offering towards this project. If you would like to donate towards this project, know of a church who would like to share Sophia’s story, or would like more information on becoming a child sponsor - please email me directly at Brittany@ProjectOrphans.org. I’ll make sure to get any question you have answered and humbly serve these children that you are sowing into.